As my colleague, John Nash, regularly reminds me, design thinking facilitators know that whenever any sort of change or innovation is discussed, the yes, but objections are inevitable. However, instead of allowing those resistance points to dominate and defeat promising ideas, design thinkers work hard to try and reframe opposition into possibility by asking the question how can we? I absolutely love the idea of spending our time talking about how can we? instead of yes, but. The former focuses on adaptation, forward progress, and collective effort and efficacy. The latter doesn’t do anything except keep us stuck. That’s not to say that concerns shouldn’t be aired. Challenges, barriers, and other issues absolutely need to be put on the table and addressed. But too often we get mired in negativity and defeatism instead of recognizing that, both individually and collectively, we usually have the ability to do and be so much more than our current reality reflects. You have completed nearly 10,000 benchmark projects over the last four years. And at least three or four of them were completed before the night before they were due. You have been Student Assistant Teachers in over forty 9th and 10th grade classes, helping students in class, in our halls, on Facebook and anywhere you were needed – guaranteeing that our younger students know what it means to go to SLA. You created SLAMedia.org — setting a standard for on-line student journalism for high schools all over the world. You have furthered the partnership with The Franklin Institute, creating Project SPACE, teaching 9th graders, presenting at the National Science Teachers Association conference and setting a new standard for how our students interface with the people of this institution. You have furthered Rough Cut Productions, creating original documentaries, short films and filming 100s of hours of SLA functions. You have created a permanent art gallery in the third floor ballroom, created a mosaic that will hang for years to come, and have pushed us to consider what happens when students treat the very halls and walls of their school as a gallery of their ideas. You created an incredible robotics team that exceeded everyone’s expectations in its first year in existence. But that should come as no surprise, as it seemed like no matter where the bar was set, you all always exceeded it. You have met Michael Dell, and, by the way, we were told that your questions were among the best he has ever had. You have run thousands of miles with Students Run Philly Style, running the Philly Marathon, the Broad Street Run, and so many Saturday morning training runs that I am tired just thinking about it. You have played — and won — on the fields and courts of Philadelphia, never letting the lack of a gym or a home field stand in the way of your desire and ability to compete, always wearing SLA’s colors with pride and representing us with dignity. You have spoken truth to power – rallying in the streets, speaking at SRC meetings, and going to City Council to ensure that your voice was heard when it came time to support public education in your city. You have hosted thousands of educators from all over the world who came to see how you learn. They often came skeptical that high school students could do what you do, speak the way you speak, learn the way you learn, but to a person, they left convinced, recommitted to the idea that schools should be places where students — and learning — matter greatly. And last week, you presented the culminating work of your time at Science Leadership Academy – your capstones. The projects were as varied as you all are. You created businesses, you wrote original plays, you created engineering projects, you put on events, you did profound scientific research, you curated galleries of your artwork. In all, you took our core values – inquiry, research, collaboration, presentation and reflection – and applied them to your own ideas, your own passions, and in doing so, created incredible artifacts of your learning. You stood in front of your community and said, “This is the scholar I have become. This is what I can do.” And in doing so, you reminded all of us of what young people can do when given the freedom and the support to dream big. Why couldn’t our students utilize a site like [Kickstarter]? Why couldn’t we embrace this interesting phenomenon and use it to get kids excited and engaged in active learning and exploration of the “Entrepreneurial Spirit” in a completely authentic manner? Why couldn’t this be the new roadside lemonade stand? One of the new ways I decide if an idea is within reason is by a simple test – Could students already be doing this independently without us? Of course the answer is yes, so why not find ways to get this in our high school classes, or maybe even in our middle school classrooms? Kickstarter offers members a page called “Kickstarter School” where it defines 8 steps to making the site work for their projects. Just think of all the places students could take their learning in these 8 steps. Now if a project doesn’t get the funding necessary, NO money goes to the project. So if a student wanted to build a rocket powered skateboard (probably not the safest project) and had a goal of $10,000 to develop it, but only had supporters pledge $200 by the time limit, then the project gets declined and the backers don’t contribute at all. Now maybe you don’t want to get into the money side of things, we all know things can get messy when money is involved, so maybe you take the idea and put your own spin on it. Maybe you run the same system where students have to make proposals for their projects but they present to you, or maybe a panel of local business owners. Maybe they are vying for seed money, and maybe you find people willing to donate that seed money. Maybe they have to present to their classmates and win their approval rather than financial support. There are a lot of ways this could go, but I would show students the actual site, because there is always that chance that you have a budding entrepreneur sitting in your classroom just looking for a way to get started. Note that instead of yes, but both of these school leaders adopt the perspective of why not? What a wonderful question with which to approach any proposed change or innovation: Why couldn’t OUR schools and classrooms do these sorts of things too? As Chris says, instead of teaching our students a bunch of stuff so that they can do amazing things and make a difference later, why not have them do amazing things and make a difference RIGHT NOW? We give too much attention to yes, but and rarely, if ever, embrace the more powerful questions of why not? and how can we? Great post. I teach at a school that requires every student to create a semester project and then present their project to a group of local professionals. At the beginning of every semester I make a pledge not to dissuade any idea a student has. It is hard. We’ve had some crazy off the wall ideas. But, what I have found is that the ideas that I thought were too crazy, too large scale, too difficult, etc are the ideas that actually come to fruition if there is a culture of support and encouragement. I am continually blown away by my students- if, and only if I choose to get out of their way and dare to dream with them. I love this post Scott. We are making huge transitions in my district right now going from a traditional model to a Next Generation Learning model, tearing down the walls of our classrooms and opening our student up to the world. I’m constantly having conversations with teachers where I hear myself responding to the “yes buts” with “how can we” And “isnt the potential for student learning worth it?”If we really want our students to have out of this world meaningful experiences we have to stop being afraid to give up our ideas of control. Managing our classrooms and controlling our students are so different. Thanks again for the post. I can see myself coming back to this a lot this summer. This is the best post I have read in some time. The “how can we” question leads to innovation and true change in practice. Unfortunately we have a lot of “yes buts” at the secondary level. Most of the “yes buts” concern entrance to post-secondary institutions or preparing students for what we percieve happens there. We have a number of teachers who have asked the “why not” and “how can we” and have some amazing experiences they are providing our students. We will use this as a prompt to discussion during our pre-service workshop this fall. I think I will even make a sign with a no “yes buts” zone on it and hang it in my office. I have taken a workshop with Dr. Nash and the thing I learned was that the key to innovation is to put all of the ideas on the table without initial shutdown statements like “yes but”. I have been an individual to use that “yes but” statement to defend my point of view. In the workshop, I learned and have since found using statements like “how can we” and a “why not” attitude is a better way to sort out what will work and what may not. There is a need to sort out solutions which are inferior to others. However, I really believe that they accomplish what Cal is talking about in a much better way than a “Yes but” statement. I took the point of this post to be that we first take the attitude that we will find a solution to a problem by placing the “how can we” statement on the table. Later after ideas are exhausted, we use the “why can’t we” statement. The yes but implies to me that yes we have a problem, but we can’t do anything about it. Or yes we could do that but here are all of the risks or things that could go wrong. That creates fear not creativity. Even the “why can’t we” is a much more postive narrowing process statement. Just my thoughts, not that I don’t agree with some of what Cal has stated. I do understand that there must be a balance between dreamers, doers, and thoughtful thinkers. Thank you for your thoughtful reply. You state that “how can we…” is likely a better beginning than “yes, but…” To that I would say “yes, and….” After re-reading Scott’s opening paragraph I find confirmation that the “yes, but…” is inevitable as are the statements you quote (that we’ve all heard many times) “we don’t have enough time”, “we don’t have the resources”, and “they won’t let us do that.” The issue is how we deal with it. Dr. Nash suggests that, “…design thinkers work hard to try and reframe opposition….” I’m suggesting a further reframe to welcome the contributors and the contribution. My assumption is that people are good and attempt to meet their legitimate needs. Meeting legitimate needs is the basis for the core conflict in any change. You identify the basic psychological dilemma facing anyone who is confronted with change as (briefly) the devil you don’t know versus the devil you know. This dilemma may also be stated as a conflict between two seemingly irreconcilable choices, embrace change versus resist change. We embrace change in order to meet our need to achieve, advance or improve. We resist change in order to be secure. Both are legitimate needs and are necessary in order to meet the goal of being a successful teacher, administrator, etc. I both appreciate and agree with your thoughts. I like change and am excited by it. I do however appreciate the comfort of order and stability. As always I’ve learned a great deal through this exchange. I have a piece of paper up on the wall that faces my desk that says Eliminate These Words Completely in one column and the other column says Make these Words a Part of Your Vocabulary. The first column has these words: I can’t, If, Doubt, I don’t think, I don’t have the time, Maybe, I’m afraid of, It’s impossible. It really does help me to consciously look for ways to make things happen rather than look for ways to not innovate. When we treat “yes, but…” as a signal of resistance we place ourselves in a defensive mindset and responding with “how do we do it?” or “Why not?” sounds defensive. “Yes, but…” is a signal that an idea is incomplete or an indication of contradictory requirements. Both are excellent opportunities to improve our idea. If we wish to make changes we need to welcome and embrace “yes, but…” with statements like; “good thinking” or “we haven’t thought of that yet” or some other positive affirmation for people who raise concerns. Then we can move on to “how do we do it?” or “how do we modify the proposal”, etc. My comment is founded on a great deal of experience with organizations. It has nothing to do with luck. It has to do with a great deal of practical work. It has to do with mindset. We need to check our assumptions, change our mindset, and embrace the skills and abilities of those who say “yes, but…” If “yes, but…” shuts down conversation or impedes forward movement, are we not able to find a better way to respond? Aren’t we able to respond in a way that opens the conversation? Aren’t we able to respond in a way that deals with the concerns and move forward? I’m suggesting a way to improve our ability to make change. I like Dave’s idea. At a recent staff meeting, I made a suggestion that if our groups were coming up with barriers, would it be possible to attach a solution to each barrier? Each group came up with solutions so it ended up creating a very different conversation. What if that was a norm for your organization? Julie, I’ve done this before with groups of educators. Get each group to identify potential/actual barriers, challenges, concerns, etc. Have them pass their list to the left, then they have to identify potential solutions to each of the concerns identified by a group other than their own. It works really well most of the time! Julie and Scott offer good strategies. Hopefully this will help clarify my thinking. Changing the way we respond to resistance is critical to our future accomplishments. We must recognize an opportunity to use the very skills and abilities that our people exercise when they do the things that we generally label as “resistance”. Many experienced teachers intuitively resist change because they have seen too many changes that caused more harm than good. They have seen too many that have wasted their time. They have seen too many that have distracted them from what they view as their primary tasks and responsibilities. These experienced teachers want to improve, but they are smart about it. They know they must systematically check any proposed change and they do so relentlessly. The phases of this checking may be described as layers of resistance that must be carefully peeled one at a time in order to build collaboration, consensus, and commitment for any change. In order to successfully implement any change that is an improvement over the way we currently perform, we must build consensus and commitment to the solution and the actions necessary to implement it. Each of the layers of resistance must be overcome in turn with our constituents. There is also a time to put individuals in uncomfortable situations by pushing change if you are confident in their abilities. I would agree that doing that to large groups is not a wise practice as I have learned through past experiences. We can not always wait for people to become comfortable with the” idea”. There are times when a ready shoot aim is appropriate. Educators like to plan but they often want solutions to things that might not even be a problem. I myself have fallen into the “what if” loop anticipating problems that may or may not arise when the time could have been better spent working productively through real problems that arise during actual implementation. Bottom line is that we can’t afford to move too slowly any more than we can afford moving too quickly when a problem arises. Just wanted to say this is a great post and point. Too often I think in any form and system we get caught saying “No” and “because” without thinking “how can we.” Spot on. Thanks for tweeting this vintage blog…we at The Academy are right in the middle of a new initiative and are hearing “yes, but” so much. 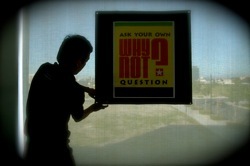 The “why not” question opens doors rather than closes them! I can’t wait to share & discuss with our team! !